Terrorist Violence Escalates Across Afghanistan And Pakistan An ISIS affiliate managed to emerge in Afghanistan despite the U.S. military's continued presence in the fight against the Taliban. Pakistan also denies the presence of ISIS despite recent attacks. Security forces guard the site of a clash between gunmen and security forces in Kabul on Monday. Gunmen stormed a partially constructed building near an intelligence training center, triggering a gun battle with security forces as detonations and shooting reverberated from the area. 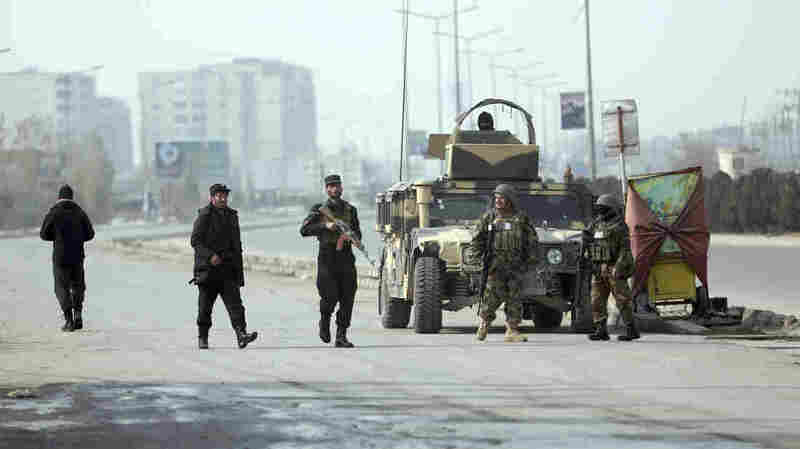 Deadly attacks in Afghanistan and Pakistan are highlighting the escalation of the longest foreign war in U.S. history as American and Afghan forces continue to fight a growing presence of ISIS and Taliban insurgents in the region. The recent violence comes as President Trump delivers a speech on Monday officially outlining his national security strategy. ISIS claimed responsibility for attacks in Kabul and Quetta, Pakistan, in the past two days, while a Taliban attack killed 11 police officers in Helmand Province on Sunday. Michael Kugelman, deputy director of the Asia Program at the Woodrow Wilson Center, visited the region last month and tells Here & Now's Lisa Mullins it is "one of the most volatile regions in the world." "Given that the chief U.S. interest in South Asia is stability, the fact that you have rampant instability throughout much of Afghanistan and much of Pakistan as well suggests U.S. interests are very much imperiled in a part of the world where lest we forget, America has been fighting its longest-ever foreign war for the last 17 years," he says. ISIS fighters launched their attack in the Afghan capital on Monday with a car bomb and rocket-propelled grenades before storming a building near an intelligence training center, according to the Associated Press. Afghan security forces fatally shot the three gunmen before there were any casualties. On the other side of the border, two ISIS suicide bombers on Monday killed nine people in a Quetta church and wounded 60 others. A powerful IS affiliate has emerged in Afghanistan in recent years that is largely made up of disgruntled former Taliban insurgents. The group is not as large or well-entrenched as the Taliban, but has carried out a number of deadly attacks, mainly targeting minority Shiites and security forces. IS has also clashed with the Taliban. The two groups are fiercely divided over ideology, tactics and leadership. Iranian Intelligence Minister Mahmoud Alavi warned last week that ISIS has begun to shift its focus into Afghanistan, Pakistan and Central Asia, following its rapid loss of territory in Iraq and Syria. "ISIS has lost land, but has not surrendered its arms, and is looking for land in Afghanistan, Pakistan and Central Asia in order to, in this way, revive the idea of the Islamic caliphate," he said. Meanwhile, the Taliban has gained control or is fighting for dominance in more than 40 percent of Afghanistan's districts, which is 3 percent higher than six months ago, according to a report from the Special Inspector General for Afghanistan Reconstruction, or SIGAR. "Helmand is one of the main concerns and has a lot of problems," Afghan Maj. Gen. Wali Mohammad Ahmadzai told NPR in November. "One of the main problems is poppy cultivation and trade and trafficking." Afghanistan is the top opium producer in the world. The drug trade finances the Taliban and contributes to corruption among the Afghan military, politicians and the police. As NPR's Tom Bowman reported, Iran has helped move weapons and Taliban fighters into Afghanistan, while Pakistan for years has allowed safe zones for the Taliban and other insurgent groups, such as the Haqqani network. The Pakistani government also denies that ISIS has an organized presence in the country, despite several attacks in recent years. Kugelman says extremist groups serve Pakistan's interests by keeping its enemy, India, at bay in Afghanistan. "Pakistan worries that India will try to use Afghanistan as a space to plan nefarious acts inside Pakistan," he says. "A terrorist group like the Haqqani network serves as a useful asset to the Pakistanis because it helps promote their interests by minimizing or reducing the likelihood that India could deepen its presence inside Afghanistan." Part of President Trump's strategy in Afghanistan includes an increase in airstrikes against the Taliban, which has come at a cost. Civilian deaths due to strikes rose by 52 percent in the first nine months of 2017, according to SIGAR, though the U.S. military has disputed those numbers. Trump has also increased troop levels to nearly 14,000, betting that fighting the Taliban harder will force the group into peace talks, Kugelman says. "That's very risky because we've tried it before ... when we had more than 100,000 U.S. troops on the ground during the height of the U.S. troop surge in 2010," he says. "Didn't work then, so I don't see why it would necessarily work now."